Many people find drawing noses difficult, especially from the side. Creating basic shapes as a guideline will make the process of drawing noses a lot less difficult. Here is a list of materials I used for the tutorial below. 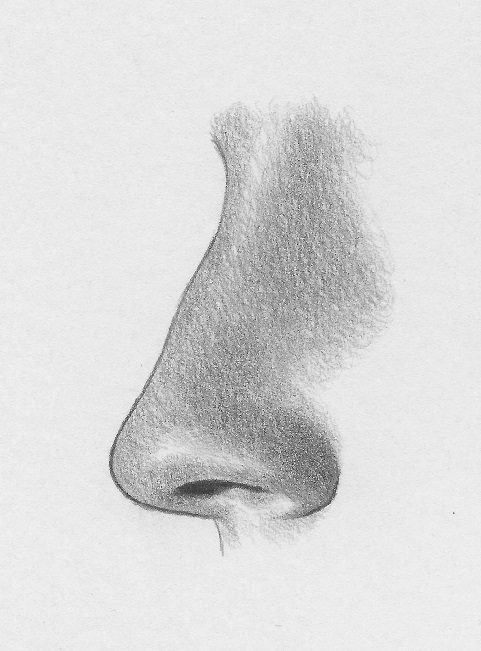 To draw the profile of a nose, you want to start out with 2 round circles which are spaced generously apart. (Imagine there is a third circle in between the 2). For the next step, I’ve drawn a triangle to give you guidance on how to draw the bridge/slope of the nose. Click here to learn where to place these circles on a face! Draw a curved slope up and around the left circle to form the tip and bridge and a curve below it to form the philtrum or cupid’s bow. The cupid’s bow should not go too far to the left or right. Draw it somewhere in between the 2 circles. Make a looped shape for the nostril. It should not be too long or too big. Again, try to draw between the 2 circles. You can erase the circles at this point and start shading. As you can see, the shading technique employed in this tutorial is circular. That will help achieve a more realistic skin texture. In my shading tutorial, I cover a few more shading techniques as well as give tips on how to shade smoothly. Click here to go to my shading tutorial. Make sure you leave some areas highlighted. Here, I have darkened some areas as well as went over the highlights with the end of a kneaded rubber eraser. The outlines have also been erased slightly. I used the blending stump, to blend around the highlights to make the skin look less harsh. I hope you enjoyed this tutorial on how to draw a nose from the side! If you have any questions or requests, let me know in the comments below! So, what’s next?? Click here to learn where to place a nose on the face! this is one of the best lessons u barely can find on the internet. welldon….. I was amazed at how realistic this turned out to be, and it really helped me with my art homework. Thank you! Geez, I have found every post in this site highly amazing infact I am highly impressed of how simple the steps are and how realistic they appear to be… Thank you… All the way from Nigeria. Awesome!!! thanks a lot for this tutorial. Hola! Shout out from New Caney Texas! Just wanted to tell you keep up the great work! Great post! The steps look simple enough to follow. I was never taught to draw noses this way but I have found it to be the best! I like how you make it look so easy, that really builds a newbie’s confidence.